We'd love to hear what you think of our site. Please let us know by filling in the form below! We recommend using a standards compliant browser such as Firefox, Opera, Safari or Google Chrome. If you are using Internet Explorer you won't experience our site to its full potential. Today is Pigeon Appreciation Day!! Feral Pigeon Project - Research blog to answer some of the mysteries about feral pigeons. Matilda's List - An international list and directory of pigeon friendly veterinarians and rehabbers. Palomacy Pigeon & Dove Adoptions - Organisation dedicated to the rescue of doves and pigeons in the San Francisco Bay area. Pandemonium Aviaries - Organisation dedicated to preventing the extinction of targeted avian species through conservation and education. Pigeon Aid UK - A site that provides advice for those who have picked up a sick, injured or baby pigeon and need guidance. 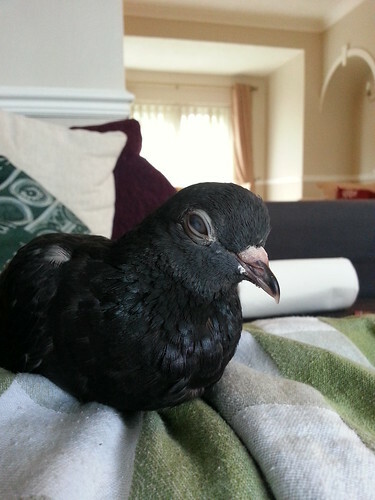 Pigeon and Dove Rescue - A website aimed at providing help for anyone that has rescued a pigeon or dove by providing details of pigeon friendly rescue centres, vets and guidance on how to care for orphaned, sick or injured pigeons. Pigeon Angels - A forum dedicated to the support & care of all pigeons, feral or fancy, that find themselves in jeopardy. Pigeon Blog - A bona fide urban pigeon telling it how it is for the pigeons of London. Pigeon Control Advisory Service (PiCAS) - PiCAS specialises in the provision of non-lethal, holistic and sustainable bird control systems, which will result in a permanent reduction in bird numbers. Pigeon Control Resource Centre (PCRC) - An online resource for anyone with a pigeon-related problem. 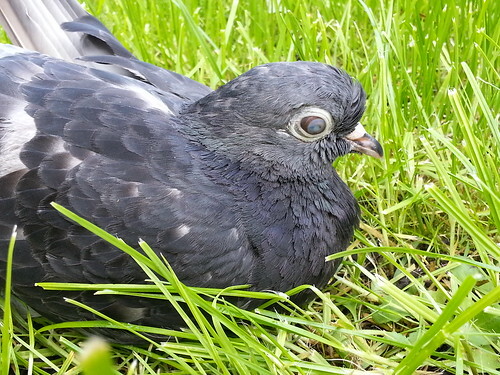 All information and advice provided on the website is geared towards completely solving pigeon control problems by the use of humane and non-lethal control methods. Pigeon Tales - Interesting blog following the lives of a family of feral pigeons living with the author. Pigeon-Talk - A global forum open to all pigeon lovers. Rescue Report - Wonderful blog about fostering and adopting pigeons (from MickaCoo Pigeon & Dove Rescue). Urban Wildlife Society - Their mission is to promote appreciation for all animals, particularly pigeons, that share the city and suburbs with humans. The website is filled with information and articles about inhumane pest control and offers advice on alternative measures. Wild Bird Fund - Website for the non-profit organization that provides assistance for wild birds, including feral pigeons, in New York City. Links to various pigeon-friendly organisations, groups, rescue centres, and vets that can help with injured, ill or orphaned pigeons and doves. Talking about the problem of continuous egg laying in birds (e.g. risks to health) and possible solutions. Discussing the genetic welfare problems of some fancy pigeon breeds. Explaining a bit about sexing pigeons. The scoop on pigeon poop! Are pigeon faeces dangerous to humans and can it be used as fertiliser? Explaining what we mean when we talk about keeping pigeons as pets. In brief: We mean keeping tame, imprinted or disabled pigeons that would not otherwise survive in the wild. Feral pigeons and disease – do pigeons carry disease? Do pigeons pose a threat to the public and your health. The quick answer is: No, they do not. Don’t believe me? Well, read the full article to find out. Hand-rearing pigeons - right or wrong? Controversial post on whether it is right to hand-rear a pigeon on its own and therefore potentially cause them to become imprinted on humans. Why we don’t normally see baby pigeons, their growth rate (photos included) and info on what to do if you find a baby pigeon. 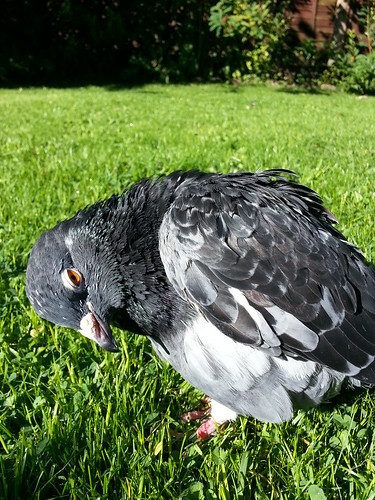 Information on what to do, as well as links to various sites about pigeon rescue. As many of you may already know, the Pigeons as Pets team have moved to Newcastle-upon-Tyne in the north of England. The move went smoothly and we’ve all settled in nicely in our new home. Both Elmo and Georgie are in good health and have explored the house and garden, and seem to give us their approval of the new spacious surroundings. Phew! We have a new addition to our family now, Hugo the cat! He turned up as a stray two years ago and adopted us as his new family (we did try to find out if he had an owner, but with no luck). Before moving Hugo had a full check up at the vets and was microchipped, vaccinated, dewormed and given the all clear health wise. And yes, it is confirmed that he is a boy, albeit a neutered one (the condition in which he first showed up, which is why I wasn’t sure). Hugo is a very placid, loving cat. He’s afraid of our pigeons and always gives them a wide berth when walking passed them. Naturally, we keep an eye out when they are all in the same room, and at night or when we’re not at home Elmo and Georgie are safely in their respective cages in the living room which Hugo hasn’t got access to. 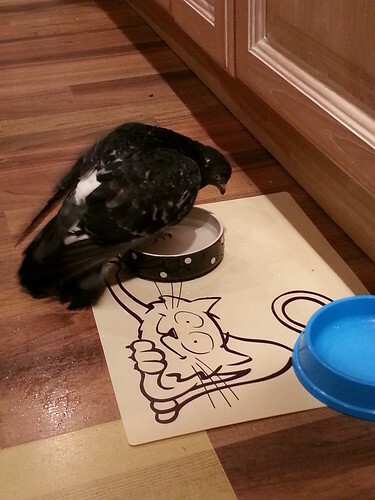 It will be interesting living with a cat and two pigeons, but I know other pigeon people out there do the same! Elmo enjoying the sunshine in the garden. Elmo having a bath in Hugo’s water bowl. Georgie napping on my lap. Georgie enjoying being in the garden. 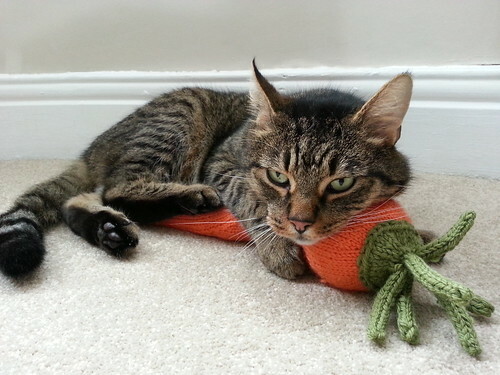 Hugo hugging his catnip carrot. Glad the move went well, Elmo, Georgie and Hugo look so happy in their new home! I am glad you are all settling in! Your little family is so cute! Thank you, Neil! We’ll post more photos soon. Thank you, Kat! They’re all doing well together. More photos to come soon. always love seeing pics of your precious ones! love the bath in the kitty’s dish! and Hugo and his carrot? That is a pic worth framing I think! Hi Cara Louise, the kitty dish bath is getting out of hand now! Elmo loves it!! I think Hugo is too scared to drink from it now. LOL. Yes, the carrot photo is precious. I love to see Hugo hugging it! Our little family consists of two dogs, a cat, and a Pigeon. Our Pigeon leaves the cat alone and vice versa. When we aren’t home, we do make sure the cat is outside, or our Pigeon is in another room with the door closed, just to be on the safe side. And our Pigeon always drinks from our dogs’ water bowl, and she takes her baths in it too….then we clean it out before we let the dogs use it. Hi Diane, thanks for commenting. It’s nice to hear of other people who have a mix species household. Pigeons tend to be the boss of the household and take all sorts of liberties.